It has been almost a year since my last post. I have not really felt much like writing for the past year or so. In fact, I haven't even written much music for over a year. It seems that I have lost something, my passion for writing, songwriting, blogging, Facebook, tweeting, even just picking up the phone and talking to friends and family. I have been pretty introverted for some time now and I am actually getting sick of myself, my problems, frustrations, lack of joy, faith, etc. So whether I feel much like writing, I am going to try and share at least one blog a month. I am ready to return to a joyful state of mind where sorrows, frustrations, and disappointments are just temporary; return to a place where I am no longer just surviving but living life to the fullest; return to the place where JOY lives, fervently bubbling out of the soul, splashing over into every aspect of my life, my husband's life, my children's lives, and the lives of my family and friends! The Bible says, "weeping may endure for the night but Joy comes in the morning" and instead of 'sleeping' through the sunrise and only living in the shadows, I am ready to let the SON shine in on my soul, illuminating the dark places, dispelling the gloom, and lighting up every corner of my mind, heart, and soul! Shine Jesus, shine! Light me up like a Christmas tree! Make me sparkle again...happy with whatever comes my way! Restore unto me the JOY of my salvation, cleanse me again. Restore unto me the FAITH of my fathers, help my unbelief and dispel my doubt about where and what you want me to be. Restore my SONG, make it new and may it reverberate through my soul. Restore the FRIENDSHIPS that I have allowed to grow fallow. Restore FAMILY connections, make them stronger than ever before. Hopefully someone will actually read this ;-) and be encouraged to strive for JOY in every aspect of your life. Perhaps you have struggled with a lack of faith, joy, and peace in your life lately. Be encouraged to know that we HAVE JOY available to us, if we just seek HIS face every morning and allow HIM to carry our troubles and sorrows. It is just that easy. Join me in pulling ourselves up out of the muck and mire, and let's let the SONshine in!!! Speaking with someone yesterday about their skill level on the piano, she stated that she wasn't confident enough to play keyboard for church yet. This beautiful, anointed, and gifted lady has been playing for years, was a music director for a number of years, and yet she is struggling with her level of ability. As we were talking, I revealed my heart to her and shared that I too struggle with my level of skill. She was shocked (not sure why since I am not the best pianist on the planet) that I feel that way. I am the music minister at a medium (and quickly growing larger) church where music is important but not really emphasized. In other words, we focus (where is rightly should be) on the WORD of God rather than really focusing on and promoting our music department. We are abundantly blessed with talented musicians, singers, songwriters, etc at our church. So, please don't think I am complaining about our music department. I do think we could push ourselves to worship more freely, blend our voices and instruments better, and generally improve our skill level as a department. But during this conversation, I discovered that I and my dear sister feel like we are inadequate. I am sure there are others who feel this way as well. The lady I was speaking with did point out that she doesn't practice that often and knows she needs to be more diligent in that area. We both confessed that we are struggling, as long time singers, musicians, and songwriters, with even just sitting down at the keyboard at home and just playing/practicing. I realized that I have moved so far "away" from music in my every day life and I honestly feel like that might be one of the reasons I am struggling. See, for years, I played every day. It was part of my daily worship to my creator. It was a channel of close communion with the Lord. And now, I find myself going weeks without touching the keyboard at home for anything other than to practice a specific song in preparation for a service. As we spoke, I was discouraged by our lack of faith in our ability to play skillfully for the Lord. I was discouraged that we seemed to doubt that gift given to us by the Lord. And I tried to encourage my fellow musician and tell her that she can play better than she thinks she can. We finished our conversation as we walked into the sanctuary, we played for the song service, and did alright. No major mess ups, the Holy Ghost moved through the song, the anointing was there, and then we got ready for the preaching. "Preach the Word" we shouted as the evangelist took the pulpit. And he did. He spoke about "Satan's Secret Fear". The evangelist told us satan fears the WORD of God, the NAME of God - JESUS -, and he fears the BLOOD of God which erases all Satan's work in our lifes! BUT...satan has a secret fear and tries his best to keep us from realizing what that is and how much he fears it. As the minister preached, I realized my dear sister and I had been discussing the one thing satan tries to pretend he isn't afraid of and does everything he can to make us doubt where we stand. Satan is afraid of our POTENTIAL in doing things for the Lord. If he can keep us doubting our ability to teach Bible studies or Sunday School, to preach the Word of God, to witness to those who are seeking a better life, to sing or play with anointing and skill, etc. And here I was, moaning and groaning about how I feel so inadequate and question (often) my gift of music. I was allowing the satan to prod me and poke me and ultimately hinder me. NO MORE satan!!!! I am determined to strike out today with Holy Ghost anointing and do whatever it takes to move beyond my lack of faith and move into a new realm of potential in God! I will do my best to spend time every day on the piano and singing. I will do my best to learn something new each week and to apply it to my ministry, either for myself or for those who work with me. I will unleash the POTENTIAL in me to teach Bible studies, to learn sign language better so I can help make our deaf saints feel more a part of the body of Christ, to be a better wife, mother, saint, prayer warrior. I am thanking God for the message He sent our way last night! And I challenge all of us...reach for your FULL potential in God!!! Do whatever you have to do to overcome your doubts and fears about the gifts/talents God has placed in your life. Allow Him to do a perfect work in you and to make you what He KNOWS you can be for His kingdom! POTENTIAL UNLEASHED...puts satan on the run! I recently posted a quote from Carl Sandburg on my Facebook and Twitter accounts. It said, "Life is like an onion: You peel it off one layer at a time, and sometimes you weep." That same day, I had a layer peeled and a few tears fell. I went in for results on some tests I had gotten done before Christmas and found that tests revealed I have Diabetes. The Big D as my pastor said last night when he asked me if I "really had the Big D" and then he stated he HATES this disease. I do too. I lost my Uncle Harold to it at age 54. My Aunt Edna lived with it for many excrutiating years that included dialysis before she passed away 13 years ago. My parents both have it. My father-in-law has it. My Uncle Johnny has it and it is really trying to take him down. I have friends who have it. It is all around me. And I guess thought I was invincible since I didn't learn from them how to avoid being diagnosed myself! So, last night in church I claimed my healing from the Big D and I believe God is going to do great things this year. For one, my husband, our children, and I are now eating healthier, exercising, and are going to learn how to avoid this disease. I am determined to lose a substantial amount of weight so that after my healing I will be in a much healthier place and can avoid a rediagnosis somewhere in the future. In other words, the onion was peeled back and revealed a new layer of life for me and mine. Tears were shed in disbelief, fear, and anguish. In the future, tears may be shed in prayer as I stand on the Word of God that says "by His stripes we are healed" but I refuse to shed any more tears or fret over the possibilities of this disease. The Big D is going DOWN and my family is going UP in health and wellness in 2012! I beseech each of you who read this blog post, do yourself a favor today, read about Diabetes and then make sure to live a healthy life that keeps you from ever being diagnosed with the Big D.
Born and raised in Texas, I came to CA in 1988. 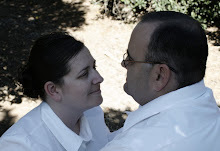 I met my husband, Mark, in church and we have been married 15 years. Mother of 3 wonderful kids, Rissa, Jessi, and Justin. I am a piano and voice instructor and Director of Music at my church, Inland Lighthouse. Some of my favorite Blog sites and Friends! This is a song God gave me in early 2007. It came at the end of a trial of my faith and consecration. God gave me this song to remind me of His faithfulness and His calling upon my life. My life song is not yet complete but I will let HIM write it instead of trying to write it myself! "You've taken every situation that arises and created music from my triumphs and my crises. You've woven every teardrop and every smile into the song You're creating in my life. Let my life be a song that testifies of Your mercy and Your grace. Let it sing through the night. Let my life be song where others can see the wonder of Your love. Lord, You are my song. You are the melody. You are the harmony. Let Your mercy crescendo o'er the notes of my life. You are the words I sing. You are my symphony. Lord, let Your grace; Lord, let Your mercy; Lord, let Your love be my song. Lord write my life song."